Sight Flow Glasses – Plast-O-Matic Valves, Inc.
Series GX Single-wall sight glass for liquids compatible with acrylic. 1/2″ – 3″ sizes, NPT or socket connections in PVC or polypro. Fluttering streamers optional. For complete details on Series GX please click here. Series GY Double-wall sight glass for liquids compatible with Pyrex inner wall. 1/2″ – 3″ sizes, NPT or socket connections in PVC or polypro. Fluttering streamers optional. For complete details on Series GY please click here. Series GYW Double-wall sight glass for liquids compatible with Pyrex inner wall. 1 1/2″ – 8″ sizes, flange connections in PVC, CPVC, PVDF, PTFE, or polypro. Fluttering device optional. For complete details on Series GYW please click here. 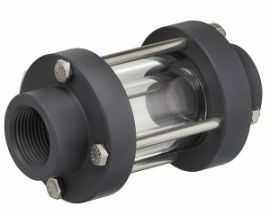 Series GX Single-wall sight glass for liquids compatible with acrylic. 1/2″ – 3″ sizes, NPT or socket connections in PVC or polypro. Fluttering streamers optional. Series GX Single-wall sight glass for liquids compatible with acrylic. 1/2″ – 3″ sizes, NPT or socket connections in PVC or polypro. Fluttering streamers optional. For complete details on Series GX please click here. 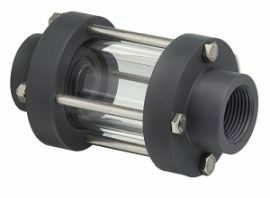 Series GY Double-wall sight glass for liquids compatible with Pyrex inner wall. 1/2″ – 3″ sizes, NPT or socket connections in PVC or polypro. Fluttering streamers optional. 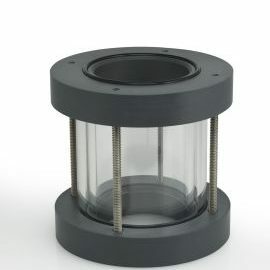 Series GY Double-wall sight glass for liquids compatible with Pyrex inner wall. 1/2″ – 3″ sizes, NPT or socket connections in PVC or polypro. Fluttering streamers optional. For complete details on Series GY please click here. Series GYW Double-wall sight glass for liquids compatible with Pyrex inner wall. 1 1/2″ – 8″ sizes, flange connections in PVC, CPVC, PVDF, PTFE, or polypro. Fluttering device optional. Series GYW Double-wall sight glass for liquids compatible with Pyrex inner wall. 1 1/2″ – 8″ sizes, flange connections in PVC, CPVC, PVDF, PTFE, or polypro. Fluttering device optional. For complete details on Series GYW please click here.